◆It is super practical educational program to grasp social needs precisely, and to let you connect directly with improvement of business. * But Advanced Phase ③ applied practice contract and conclude with Tohoku University as needed. There is the case that joint research funds produce on this occasion. This human resource development program consists of two Phase of Basic Phase of the large number of people system and Advanced Phase of the small number of people system. 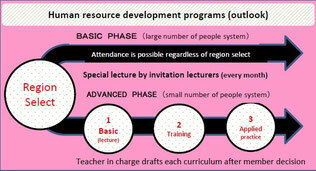 Because these two Phases are beginning the lecture in parallel, only in Basic Phase, the attendance only for Advanced Phase is possible, and the attendance is possible at the same time. It invites the expert of each field, the development person in charge of the company, and the expert of the reliability engineering, the expert of marketing, they give a lecture to the aim at once a month. Advanced Phase is divided 3 courses ① basics ② training ③ applied practice. (The attendance only for ① or ③ is possible, too)①In the basics, classroom lecture by the visiting lecturer that the teacher of the charge laboratory or the charge laboratory depends on. ② In the training, class through the use of the advanced apparatus of the charge laboratory possession.③In the applied practice, it becomes the cooperative research substantially. Each teacher makes the curriculum suitable for member of a class after confirmation at the time of an interview by the experience and knowledge, real duties contents of the member. ★we accept the application of the applied practice course any time at the secretariat. ※About application for 2013, it switched to accepting an application at any time. At the start time, we consult after an application reception desk.